Hypatia was born in Alexandria, Egypt, around the year 370. We know nothing of her mother, but we do know that she was educated by her father, Theon, a distinguished mathematician and astronomer at the Museum, the Alexandrian institution of higher learning, which contained the famous Alexandrian library. After her formal education, which evidently included mathematics and astronomy, she traveled to Italy and Athens, where she was the guest of Plutarch the Younger, the biographical writer and philosopher, and his daughter Ascelepigenia. After traveling abroad to institutions of higher learning around the Mediterranean, she returned to teach mathematics and philosophy in Alexandria. In the year 400, she became the leader of the Neoplatonic school of Alexandria. The Neoplatonists were the last important school of Greek philosophy, active during the third century C.E., and were dedicated to the ideas of Plato. She became a widely recognized authority, and her fame attracted numerous students; she was visited by outstanding thinkers of her time. 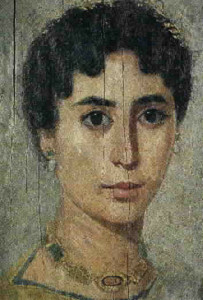 Hypatia is best known as a philosopher and mathematician. She is the first woman known to have written on mathematical subjects, including conic sections, which she studied extensively, and she suggested refinements of the algebra of Diophantus, an earlier Egyptian mathematician. Hypatia wrote several treatises in philosophy, mathematics, and astronomy, which are referred to in other contemporary writings; unfortunately, none have survived except for fragments of a treatise that some scholars think may have been co­authored with her father. She was also an inventor, and has been credited with invention of the astrolabe, used to measure star positions relative to Earth, and a still for purifying water. Hypatia died in Alexandria in 415 in a brutal assassination when she was tortured to death by religious zealots devoted to Cyril, the new Christian patriarch (religious leader) of Alexandria. Some accounts link her assassination to her association with Orestes, the non­Christian prefect of Alexandria, whom Cyril opposed. For 15 centuries, Hypatia was often considered the only female scientist in history. Indeed, she was the most famous of all women scientists until MARIE CURIE. During her lifetime Hypatia became a widely recognized scholar and an authority in her fields. She led the Neoplatonist school until its downfall following her death. The Neoplatonists were responsible for keeping the thinking of Plato alive in the waning years of Roman Empire, particularly his belief in an absolute world of ideas distinct from physical reality. Hypatia attracted widespread attention not only in her own right, but throughout subsequent history. Charles Kingsley (1815­1875) wrote a historical novel about her called Hypatia, which was reprinted in 1968. Her fame and influence was assured by the atrocity of her martyrdom—her violent death caused other scholars to leave Alexandria. Together with the complete destruction of the great libraries of Alexandria by 391, her death is regarded by many as marking the end of the influence of Greek philosophers and scientists of antiquity. *Scholars cannot date the specific events in Hypatia’s life with accuracy.